JUCY have entered the USA with depots in Los Angeles, San Francisco and Las vegas, Nevada . The zany colored vans are popular with inbound European tourists who are after a well equipped van that is easy to drive. 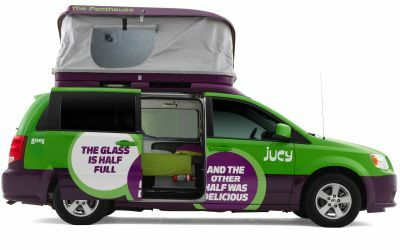 The Jucy Champ USA is currently the only camper category available, the Champ has 2 double beds,fridge, gas cooker, sink and DVD player. They Champ base van is the Chrysler Town with a custom built interior and four seat-belts. Luggage space will be limited in all JUCY vans. The best advice is to use soft bags rather than hard cases. This will give you more flexibility in making room for your luggage.